The heaviest of our two fabrics. These 100% made in USA polyester twill shirts feature a patch front pocket and button down collar and button placket front. The sleeves are available in a hemmed short sleeve or a button cuffed long sleeve. Both styles can be striped for ANSI Class 2 or Class 3 compliancy. A traditional weighted fabric. These shirts are made in the USA of 100% polyester broadcloth and feature a patch front pocket and button down collar and button placket front. 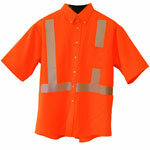 The sleeves are available in a hemmed short sleeve or a button cuffed long sleeve. Both styles can be striped for ANSI Class 2 or Class 3 compliancy.